New Directions Publishing Corporation, 9780811226080, 128pp. The Last Wolf, translated by George Szirtes, features a classic, obsessed Krasznahorkai narrator, a man hired to write (by mistake, by a glitch of fate) the true tale of the last wolf of Extremadura, a barren stretch of Spain. This miserable experience (being mistaken for another, dragged about a cold foreign place, appalled by a species' end) is narrated--all in a single sentence--as a sad looping tale, a howl more or less, in a dreary wintry Berlin bar to a patently bored bartender. 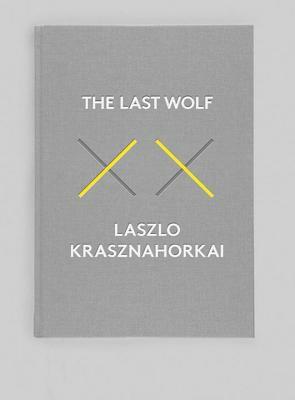 The Last Wolf is Krasznahorkai in a maddening nutshell--with the narrator trapped in his own experience (having internalized the extermination of the last creature of its kind and "locked Extremadura in the depths of his own cold, empty, hollow heart")--enfolding the reader in the exact same sort of entrapment to and beyond the end, with its first full-stop period of the book. In Herman II: The Death of a Craft, the same situation is viewed by strange visitors to the region. Hyper-sexualized aristocratic officers on a very extended leave are enjoying a saturnalia with a bevy of beauties in the town nearest the forest. With a sense of effete irony, they interrupt their orgies to pitch in with the manhunt of poor Herman, and in the end, "only we are left to relish the magic bouquet of this escapade..." Translated by John Batki.